This was for the Asynchronous Game Development Challenge for the game development club. The idea was that in the first phase, a designer would create a design document for a game, and in the second phase artists and programmers would implement it. The design for this game was created by David Do, the in-game art was made by Andrew Dakhil, and the programming, level design, and intro and outro art were done by me. The idea is that you are a defenseless character in a frozen post-apocalyptic wasteland where polar bears rule the land. 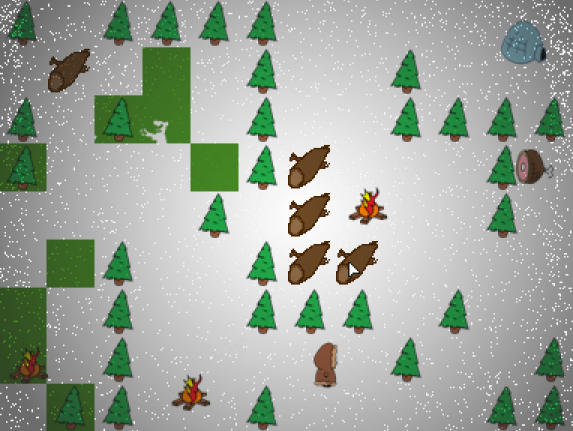 The bears, who are perfectly white, are invisible against the white snow, and you are slowly freezing to death when you stray away from the safety of the fire. The combination of these two mechanics creates an interesting tension when you are forced to throw yourself blindly into the snow, going slow enough to dodge any bears that present themselves but fast enough that you don't freeze.